Mirrorless cameras continually grow in popularity on the market in the recent years. These cameras are extremely loved by many photographers of almost any genre due to the superior qualities and advantages that they offer, such as the relatively compact size, advanced functions and features, as well as consistency and reliability. Nevertheless, there is one side feature that may be very important to you: WiFi. The wireless connectivity indeed is a nifty feature for easier file sharing across different devices, and, in more advanced cameras, even allows you to control the camera remotely through your mobile device. The title of the article has explained itself. It is ridiculous if we insert a mirrorless camera that has no WiFi into the list of best 5 mirrorless cameras with WiFi 2016. The chosen camera should feature built-in WiFi that is reliable and can actually be used in real-life usage. Of course, the higher the resolution, the sharper and more detailed the images can be. While resolution can be over-exaggerated at times, it is still quite an important factor, especially if you want to have pictures that don’t break into pixels upon zooming. On the other hand, sensor size is also one crucial factor that can be quite too complex to be explained. However, in general, most people can agree that the larger the sensor size, the better, as the produced images tend to have better color depth and dynamic range. Other features especially include the maximum shutter speed, burst mode, and ISO ratings, as these features often play important roles in usage. Any other additions are welcome plus points, such as anti-shake enhancement, weatherproof and/or dustproof construction, other connectivity options, etc. Now, let us see the best 5 mirrorless cameras with WiFi 2016! Sony a7R II is the ultimate beast of mirrorless cameras! Seriously. Featuring the world’s first full-frame back-illuminated Exmor R CMOS Sensor that has a whopping 42.4MP resolution, Sony a7R II can deliver phenomenal state-of-the-art image results. You should no longer think that you can only have either high resolution or good noise performance – Sony a7R II can give you both. The dynamic range performance is also very astonishing, to the point where you can shoot stills and videos of high-contrast scenes with true detail and accuracy. It shoots 4K videos. The Hybrid AF system is also very formidable, featuring 399 AF points, plus there is a five-axis image stabilization system that makes your camera virtually vibration-free. Besides WiFi, this majestic mirrorless camera also features NFC for connectivity. Check the best deal for Sony a7R II here! Panasonic LUMIX GH4 has managed to stand out from the competition as one of the most complete hybrid cameras that can perform equally well for both professional photos and videos. It is armed with a 16.05MP micro four thirds digital live MOS sensor, furtherly powered by a 4-CPU Venus Engine. It is able to capture high-resolution JPEG and RAW still images with excellent details, colors, and depth. In addition, it is already able to record videos in UHD 4K (3840 x 2160) at 30p/24p, and in DCI 4K (4096 x 2160) at 24p. The 49 AF points are fast and reliable for both photos and videos. It has high-res OLED monitor and electronic viewfinder. The body is made of weather-sealed magnesium alloy, and it comes with WiFi and NFC. Check the best deal for Panasonic LUMIX GH4 here! Check the best deal for Olympus PEN-F here! Check the best deal for Sony Alpha a6300 here! Now, this is the best budget mirrorless camera with built-in WiFi. Coming at a far more affordable price, Olympus OM-D E-M10 Mark II can already deliver impressive JPEG and RAW shots with its 16MP micro four thirds Live MOS sensor. Its still images surprisingly have punchy, solid colors, accurate exposure, and very minimal amount of noise. It even has been equipped with five-axis image stabilization system that greatly reduces any blur and vibration. It is also quite fast in general, whether in startup speed, focusing, or burst shooting. Even so, the continuous AF may struggle a little bit to constantly focus on moving objects. It also tops out video recording at ‘only’ 1080/60p. We have compared Fujifilm X-T10 vs Olympus OM-D E-M10 Mark II on the previous post, read it well! Check the best deal for Olympus OM-D E-M10 Mark II here! 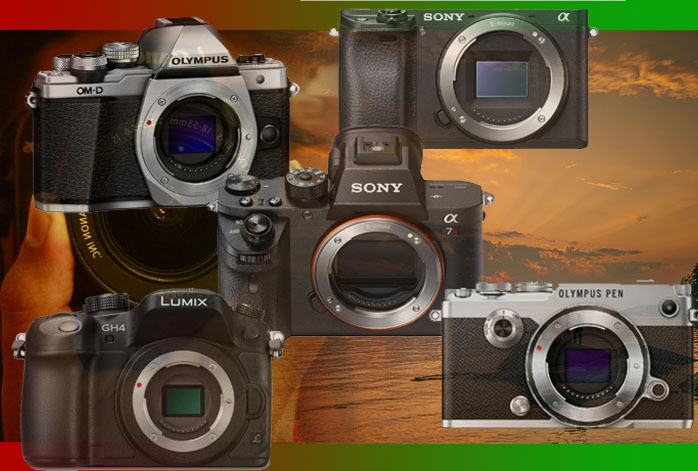 Which is the mirrorless camera that attracts you the most?